With winter being in full throes (despite the fact it hasn’t “officially” started yet), one signpost constellation is Orion the Hunter, which magesitcally covers a rather wide area of the southern sky.This constellation is full of lore and myth from different cultures. But that aside, it’s a wonderful image on the tapestry of the night sky through the winter. 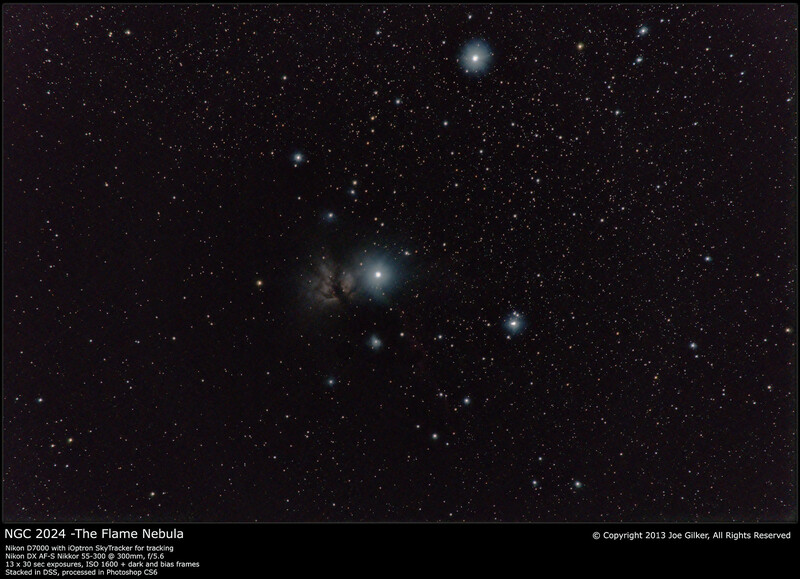 And it’s the target of many amateur astronomers and astrophotographers due to its myriad of nebulae contained therein. I’m really not able to find a definitive answer as to how many nebulae it contains. Figures tend to range from 10-20, depending on who you ask. Either way, there’s no shortage of stuff to see. The Great Orion Nebula, the Running Man Nebula, the Flame Nebula, The Horsehead Nebula, and Barnard’s Loop are among some of the wonderful sights that can be seen and photographed. It’s a cornucopia of targets for those willing to search them out and patient enough to find and perhaps image them. 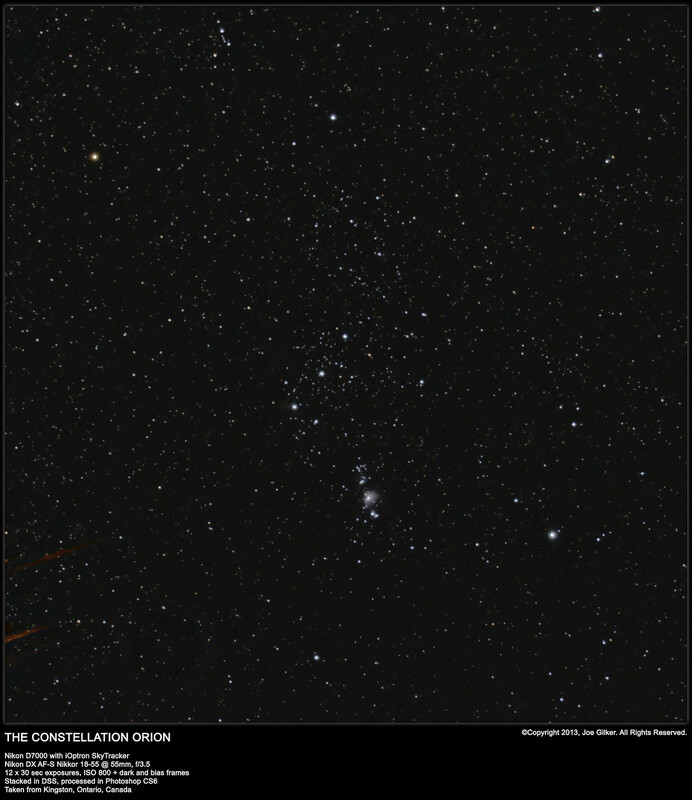 Through the winter, I’ll be making several of the well-known objects in Orion my target. 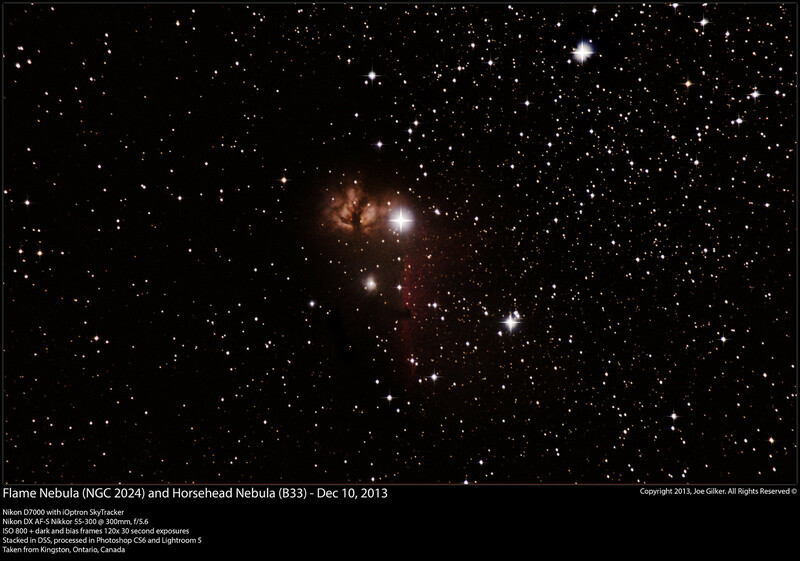 I’ve already started with the Orion and Running Man Nebulae, as well at the Flame and Horsehead. Both have been featured here in previous installments of my blog. All are simply 1 hour’s worth of 30 second exposures at this point. I’ll be adding more data to those over the coming months. 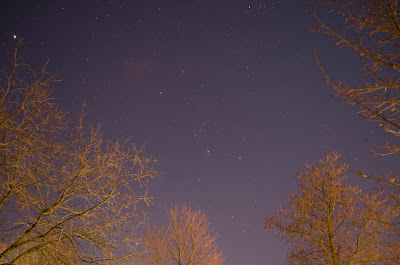 But on a very cold evening a few nights ago, I stepped out with my camera and SkyTracker. The seeing was about 3/5 with a 60% moon in the western sky. I decided that photographing the deep sky objects wasn’t going to bear great fruit, so I figured I would try to catch the entire constellation in one image. I popped on my 18-55mm lens, aligned my mount, and fired off a bunch of 30-second subs, darks and bias frames. The resulting subs didn’t look like much. Once stacked, the light pollution and gradient in the background made me think that this would be a lost cause, can be seen by this image. The trees in the foreground weren’t a big issue, as I planned on cropping the image anyway. One of the subs (light frames) that was stacked for the final image below. Jupiter is visible in the upper left corner. Then it came to processing the image. I was able to remove the gradient and get a nice neutral, dark background. It actually turned out much better than I had anticipated. Betelgeuse shone magnificently. M42, the Orion Nebula was clearly visible, and I even managed to get a faint hint of the Flame Nebula. Overall, I’m very pleased with the results of this session. 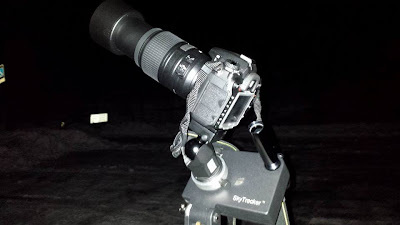 The iOptron SkyTracker is an equatorial tracking mount for taking long-exposure astrophotography with only a camera and tripod. When properly aligned to the celestial pole, the unit will automatically track the motion of celestial objects, allowing you to precisely take exposures of up to several minutes with at reasonable magnification levels. The last few days have not been without their challenges in processing my images. As I posted yesterday, I got some really great data on my Friday evening photo session, but have been unable to process the resulting images to any degree of satisfaction. With some support and advice of some of the great folks over at the Astrophotography / Amateur Astronomy Enthusiasts group on Facebook, I managed to process two of my images not only to my satisfaction, but well beyond my expectations. 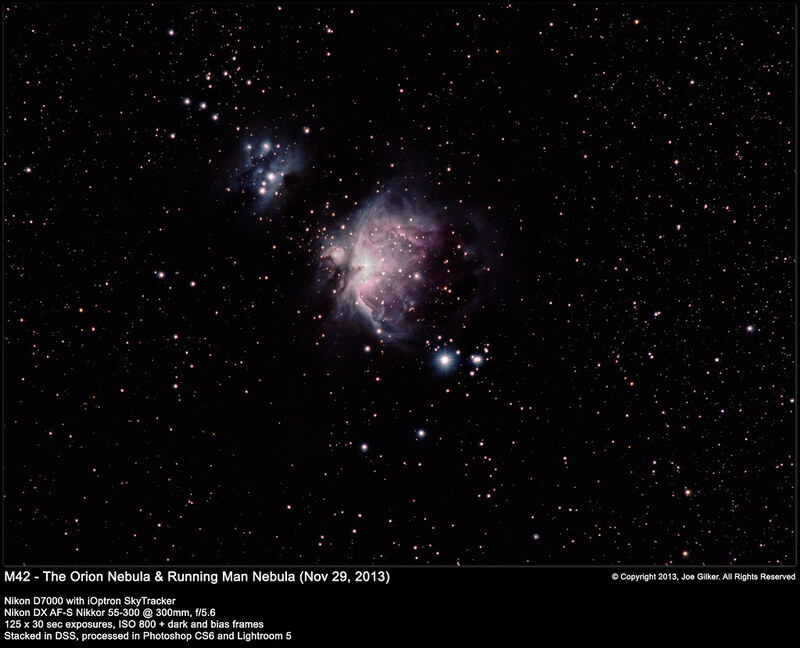 The first was a wide field combination of M42, the Orion Nebula and NGC 1977 The Running Man Nebula. The detail that I managed to pull out here was actually pretty stunning considering this was nothing but a collection of 30 second exposures at ISO 800. I really didn’t expect this much detail. I pulled out as much detail as I could. Of course, the core was a big burned out, as is expected from this nebula. I went and found one of my earlier telescopic imaged of M42 where the core was very detailed and the Trapezium was nice and sharp. I scaled and aligned the image and with layer masking I Photoshop added a nice, sharply detailed core to my image. I also played around with the HDR process. I create an HDR version of my original image, and layered it on at 50% with screen blending. The highlights and shadows just jumped right out of the screen. I finished up by adding a very subtle false luminosity layer. I took the HDR version, converted the image to an Lab Colour format (LRGB) and pulled out the luminosity layer. I layered that over my final image. That brought out some of the nice highlights and subtle detail that would otherwise have gone unnoticed. And this was the final result. The next to roll off the line was M45 – The Pleiades Cluster. 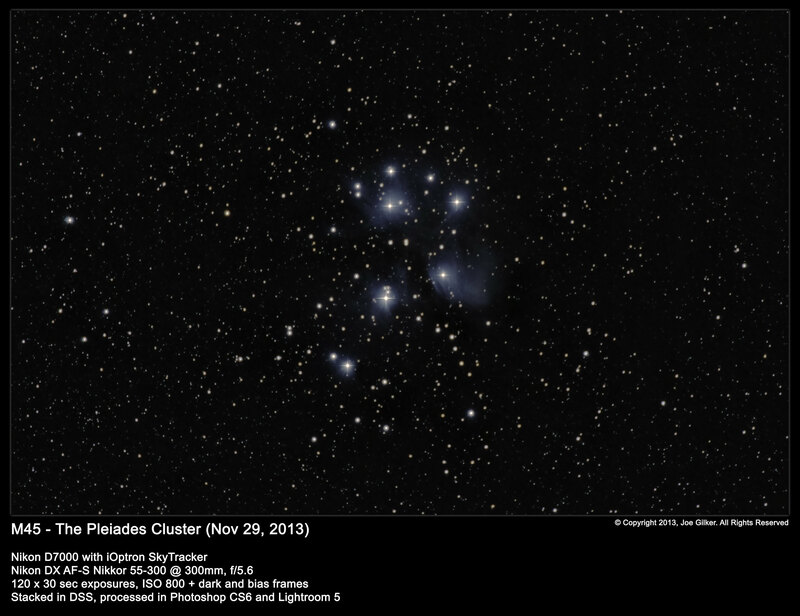 I’d taken a few images of this cluster before, but my images always turned out rather flat. I’d always taken them from a tripod with the camera without any tracking, so I was limited to 1.6 second exposures when using my 300mm lens to avoid any star trailing. As a result of these short exposures, I got really sharp detail and good noise reduction, but never managed to capture any of the beautiful blue nebulosity in the cluster. The nebulosity really required longer exposures which I really wasn’t equipped to handle at the time. 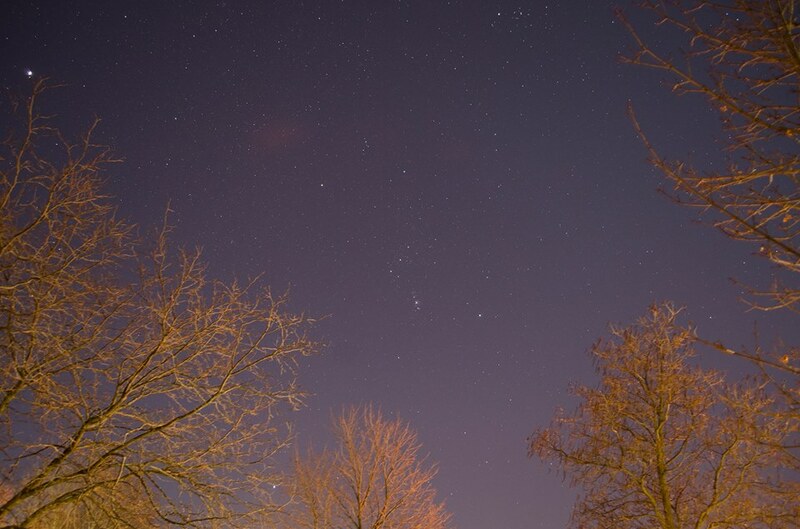 This time around, I managed to pull out 120 x 30 second exposures. This was enough to bring out a fair amount of the nebulosity. I wanted to collect more data, but with M45 being right overhead, frost was starting to form on my camera lens, so I had to quit. But what I did get in terms of raw data left me quite pleased. My first attempts at processing this image were very frustrating. No matter what I tried, I was unable to get anything but white or grey results. M45 is famous for it’s blue colour, but try as I might, I was unable to pull out these blue tones. Even trying to insert false colour wasn’t working out for me. But it turns out that being inexperienced with Photoshop, I was going about it the wrong way. Advice given to me by members of the aforementioned Facebook group pointed me in the right direction. As a result, I now know how to adjust the colour balance of my images properly to bring out the natural colours. Now I still have a new image of M31 I need to process, and as I left for work this morning, I set the Flame Nebula image I took to stack again in DeepSkyStacker. Hopefully I’ll be able to apply the new techniques I leaned yesterday to this image and pull out some more detail out of it. I’ll be trying to process my new M31 data after that. So all around, I must say that I’m very pleased with how things have gone and very pleased with my progress to date. It seems the dark art of astrophotography is really a multi-disciplinary pursuit. It’s dependent not only on the weather and proper setup of the photographic equipment, but also highly dependent on the Photoshop skills of the person processing the image. 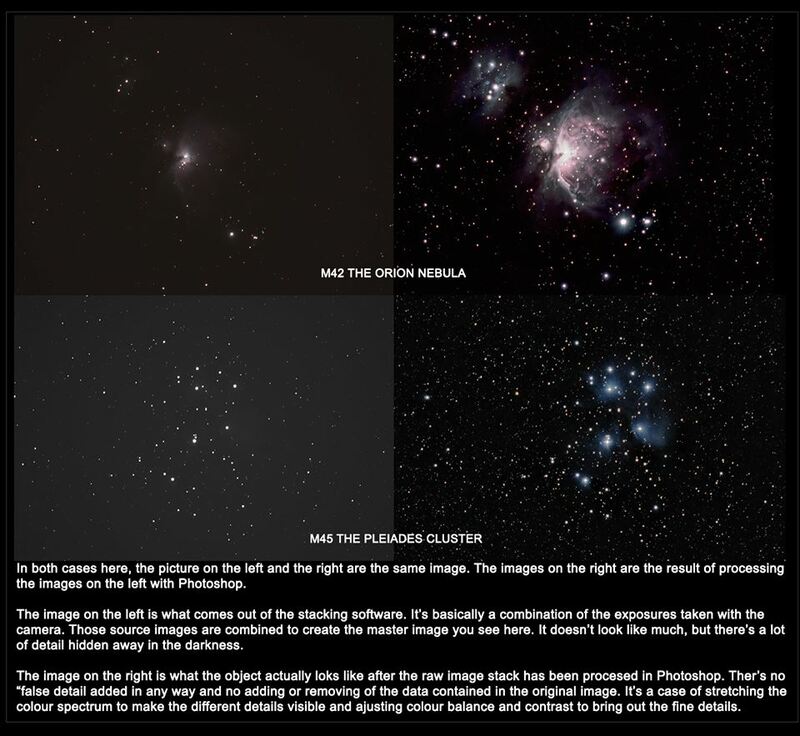 And unlike what people may think about Photoshop in how it’s used in the modelling industry to retouch photos and make models “perfect”, when it comes to astrophotography, we aren’t faking an image or editing it in a way that we’re falsifying the data. Photoshop is used to pull out colours and subtle details that are initially hidden to the eye. No false data is added. This is the true appearance of the object being photographed. So that all for now. Hopefully my next blog update will be the review of the iOptron SkyTracker I’ve been working on. So on Friday evening, I was out shooting some images using my new iOptron SkyTracker mount. I had some great success with it, actually. The evening wasn’t without its snags, of course, but overall things went really well. However, I’ve been having a real challenge when it comes to processing my work. I’ve spent a lot of time this weekend trying to process my images. And I can’t seem to get any colour out of them whatsoever. My “worse” image – the Flame Nebula turns out to be the only one that’s displayed colour in the final results, despite being the one that I have the fewest frames for. I know there’s something I’m not doing right in my processing. I’m not sure if it’s in DeepSkyStacker or Photoshop. Unfortunately, I’m not experienced enough to actually know WHERE I’m erring in my process. It can be quite frustrating at times. But I’ll keep soldiering on. Also, coming soon will be a review of the iOptron SkyTracker, as it was requested by a few people already who are curious about it.